With spring officially arriving this weekend, many of us will begin planning the annual maintenance for our houses and yards. 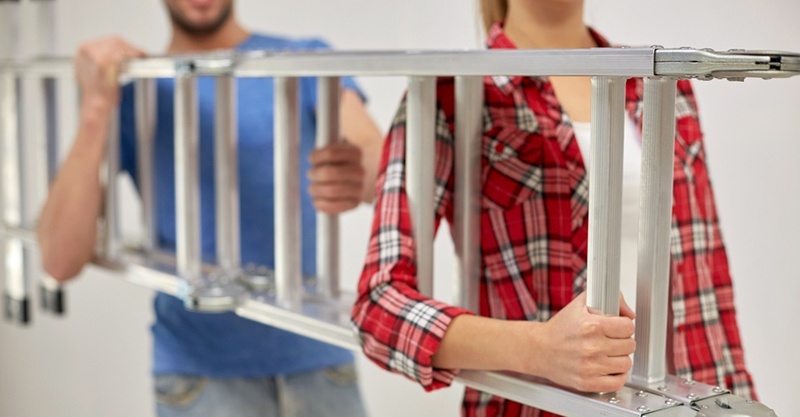 Very often, these tasks involve ladders, so let’s spend a moment today reviewing some best practices to stay safe when using this common home and workplace resource. A ladder’s type and length should be matched to the task. Check your ladder’s weight-bearing capacity. To determine this, look for a label on the ladder that tells you the maximum number of pounds it can safely hold. When determining if a ladder’s rating is sufficient, the weight of everything the ladder must carry -- all clothing, tools, and materials -- is added to your weight. Keep in mind that a ladder’s stated length is not the same as its working length. A ten-foot stepladder, for instance, will not allow you to stand ten feet above the ground, because you cannot safely stand on the top step. For that task, you would need a longer ladder. When working near electricity or overhead power lines, never use a metal ladder. To reduce the risk of electrical shock, choose a fiberglass or wooden ladder, but be aware that even these materials can conduct electricity if they become wet or excessively soiled. When moving a ladder to a location, carry it parallel to the ground and be particularly cautious when you approach areas such as doorways or corners where you have an obstructed view. If the ladder is long, get a second person to help with carrying and setup. Before placing a ladder, survey the location where the ladder will be used. Do not set up a ladder in front of a doorway, unless the door is blocked open, locked, or a guard is posted. Make sure that the area around the base of the ladder is free of debris and tools, and that there are no overhead obstructions. Be particularly cautious of overhead power lines – keep all ladders and tools at least 10 feet away from live power lines. To set up a straight or extension ladder, begin by positioning it on the ground so that the bottom end is against the wall or structure. Lift the top end of the ladder over your head and walk the ladder up by moving your hands from rung to rung. If you are using an extension ladder, when the ladder is in a vertical position use the rope and pulley system to raise the fly section and lock it securely in place. Rest the top end of the ladder against the wall, and lift or slide the base out. Ladders are safest to use when they lean against a structure at a 75.5-degree angle – this is important because an angle that is too steep can cause you to fall backward; while an angle that is too horizontal increases the possibility that the ladder will slip out from under you. If you are setting up a stepladder, don’t use it folded and leaned against a wall as if it were a straight ladder. Make sure it is fully open and the spreaders between the two sections are extended and locked. To ensure a ladder’s stability, place its feet on a surface that is firm, level, and dry. On smooth surfaces, use a ladder with non-skid feet to help prevent slipping. Do not place ladders on boxes, barrels, tables, scaffolds, or other unstable surfaces to gain additional height. One of the riskiest things you can do on a ladder is to overreach or lean to the side while you are working. To maintain balance, keep the center of your body within the side rails. If you’re unable to reach your work while standing on a ladder, do not try to “walk” or rock the ladder from side-to-side to shift it into place. Climb down and reposition the ladder from the ground. Every time you use a ladder, you have a series of choices, and the decisions you make will determine whether you remain safe. Always choose to follow good ladder safety practices! Need ladder safety training at your place of business? Summit can help! Check out our catalog of courses by clicking the button below.